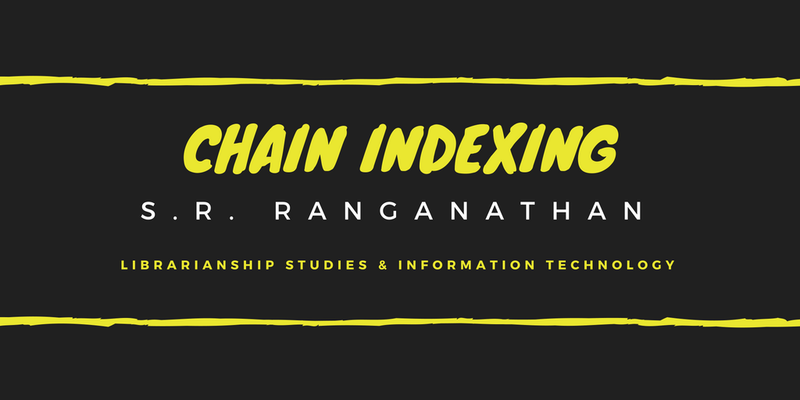 Chain Indexing or Chain Procedure is a mechanical method to derive subject index entries or subject headings from the class number of the document. It was developed by Dr. S.R. Ranganathan. He first mentioned this in his book “Theory of Library Catalogue” in 1938. In Chain Procedure, the indexer or cataloguer is supposed to start from where the classifier has left. No duplication of work is to be done. He/she has to derive subject headings or class index entries from the digit by digit interpretation of the class number of the document in the reverse direction, to provide the alphabetical approach to the subject of the document. Ranganathan designed this new method of deriving verbal subject heading in 1934 to provide the subject approach to documents through the alphabetical part of a classified catalog. This method was distinctly different from the enumerated subject heading systems like Library of Congress Subject Headings (LCSH) or Sears List of Subject Headings (SLSH). He discerned that classification and subject indexing were two sides of the same coin. Classifying a document is the translation of its specific subject into an artificial language of ordinal numbers which results in the formation of a class number linking together all the isolate ideas in the form of a chain. This chain of class numbers is retranslated into its verbal equivalent to formulate a subject heading that represents the subject contents of the document. The class number itself is the result of subject analysis of a document into its facet ideas and linked together by a set of indicator digits, particularly when a classification system like Colon Classification is used for the purpose. As this chain is used for deriving subject entries on the basis of a set of rules and procedures, this new system was called ‘Chain Procedure’. This approach inspired in many other models of subject indexing developed afterward, based upon classificatory principles and postulates. Chain Indexing was originally intended for use with Colon Classification. However, it may be applied to any scheme of classification whose notation follows a hierarchical pattern. Determination of the specific subject of the document. Determination of links and construction of chain. It is done with the help of the title of the document, its table of contents and by a careful perusal of the text. By analyzing the subject contents of a document one arrives at its specific subject. Naming the specific subject of the document expressively in the natural language. Representation of the name of the specific subject in Kernel terms (fundamental components). It is done by removing all the auxiliary words from the title. Determination of the category of each fundamental component according to a set of postulates and principles formulated for this purpose. Transforming of the analyzed name of subject by rearranging, if necessary, the fundamental components, according to a few additional postulates and principles formulated for the purpose of governing the syntax. Standardization of each term, in the transformed name of the subject, in accordance with the standard terms used in the preferred scheme of classification. Representation of class number in the form of a chain in which each link consists of two parts -- the class number and its translation in natural language. The class number and its translation is joined by “=” sign, and these signs are joined by downward arrows. Determination of different kinds of links such as Sought Link (SL), False Link (FL), Unsought Link (USL) and Missing Link (ML). FL : A link is a false link if it ends with a connecting symbol or relation device, etc. USL : A link in which a user is not likely to approach a document. ML : A link in a chain-with-gap, corresponding to the missing isolate in the chain. SL : A link in which a user is likely to approach a document. Derivation of the subject heading from each of the sought links in the chain in a reverse rendering process. In this step, subject reference entry is prepared for specific subject entries. In this last step, all entries are merged and arranged in a single alphabetical sequence. The document entitled ‘Macbeth’ by William Shakespeare, having class number O111,2J64,M will generate the following chain. This procedure, i.e., chain indexing can be applied with ease to any classification scheme whose notational symbols indicate the subordination of each step of division e.g. Colon Classification (CC), Dewey Decimal Classification (DDC), Library of Congress Classification (LCC), etc. Chain indexing saves the time of the indexer, as he makes use of the class number provided by the classifier, thus, avoiding duplication of work, in analyzing the document and the formulation of class number. Chain indexing provides alternative approaches through reverse rendering to its classified file. As chain procedure is based on the structure of the classification scheme and on the terminology found in the schedules, its operation is speedy and semi-mechanical. Chain procedure is economical, as it drops each term after it has been indexed, thus, avoiding the permutation of component terms. In the case of chain indexing, only one index heading with complete subject formulation is prepared for a specific document. Other entries are prepared by the successive dropping of terms serve a successfully larger number of specific subjects. This provides the facility for generic as well as specific searches. Chain procedure is amenable to computerization. Programs have been successfully written to generate subject headings both from class numbers and feature headings following the reverse rendering method. Chain procedure may be used to derive indexes to classification schemes and books. Similarly, it may be used in formulating headings necessary for guide cards on catalogue, stock room guides, shelf guides, etc., in a systematic way. It is totally dependent on a scheme of classification, as a result, it tends to suffer demerits related to the scheme of classification automatically. The entries prepared through chain indexing has only one specific entry, others are all broad entries. In chain indexing, sometimes a step of a division may go unrepresented, by a further digit of the class number. This creates the problem of the missing chain. Reverse rendering of terms, while preparing the entries is confusing to the user. Chain indexing was first used by the Madras University Library in 1936. It has been widely accepted and used by British National Bibliography (BNB) from 1950-1970, LISA is based on Chain Indexing, Indian National Bibliography (INB) has been practicing chain indexing since 1958. Documentation Research & Training Centre (DRTC) has lately found that chain procedure is fully amenable to computerization. Programs have been written to generate subject heading from class numbers following reverse rendering method. Subject Cataloging - A collection of articles on subject cataloging and subject indexing.